The ACB is a versatile music ensemble that revels in the opportunity to bring to our audiences everything from classical and traditional music to pop, jazz, movie scores and even music selected from popular video games! 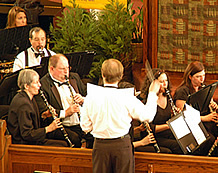 In our 2011 concert season, the ACB included several unique selections in our performances, including a musical background to a video presentation of "Godzilla takes Vegas" and a live musical accompaniment to a professional reading of the famous poem "Casey at the Bat". Please see our upcoming schedule of concerts. We also are eager to bring our music to all of the people of the Atlanta area, so along with our regular concert venues we have made a great effort to bring the band to different areas around Atlanta, performing at suitable high school auditoriums, churches and synagogues around the metro area. The performances are presented to the general public and/or special audiences, free of charge much of the time. We are striving to provide accessibility to the arts to populations for whom concert attendance may not be a common opportunity. Assisting and encouraging young students of music through our mentoring programs and selected participation in the band.